Thank you for your recent request to my office for a town hall meeting. Having traveled the entirety of our district so many times during my time in Congress, doing thousands of events and public appearances, …I feel confident there are very few voters who pay attention in the 1st Congressional District of Texas who don’t know exactly where I stand on the issues and why—especially regarding the issue of Obamacare. In fact, in November, over a quarter of a million people were polled, and 73.9% said they agreed with me. I made clear for the last seven years that I would do all I could to repeal Obamacare. I was one of the few who read it before I voted. …and that is why brave, brave sir Robyn, er, Screwie Louie, will not be holding any Town Hall meetings. The end. This entry was posted in 4th Reich, Screwie Louie Gohmert, Y'all Qaeda. Bookmark the permalink. Maybe they should show up at his house, maybe he’ll talk to them there. Maybe not. Maybe there should be a few cameras there too so when grandpa a-hole turns the hose on people he can get on the news. 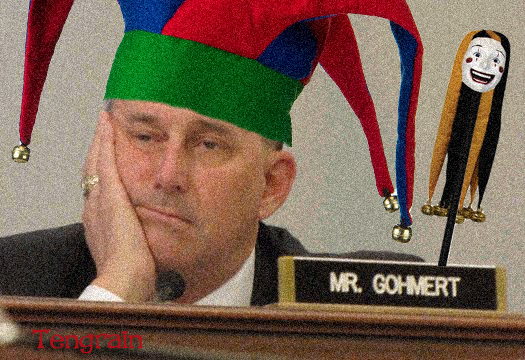 I truly believe that Louie Gohmert-Pyle is the dumbest MoC in my (66yr) lifetime. And most certainly devoid of the innocent charm of his namesake. Gohmert is the Lancome Lady of Texas. Tumbling Tumbleweeds usually go where the wind takes them. That much we do know. What’s he worrying about? He’s allredy brain dead. “I was one of the few who read it before I voted.” People who look that dumb aren’t readers. Juanita Jean pointed out that there is no such thing as a “felony judge” in Texas, so that’s bs for starters. He was talking about the other Texas.